Thus will I begin this review with a dramatic retelling of The Quest To Learn a New Game System. Our story begins with a nameless hero admiring the clever pedagogy of the fabled Player’s Book of the Red Box. Taking the form of a single-player choose your own adventure story, this tome of knowledge has a Miyagi-like sensibility to its teachings. Narrative and exposition led to choices for our nameless hero. Choices led to the fates dicing with his future. Dicing led to math, and before our hero could say, “hobgoblin,” he had gone from sanding the floor to doing Karate. You’ve completed the solo adventure in this book, but your adventures in the Dungeons and Dragons world are just beginning! Gather some friends and have them create their own characters by reading through this adventure like you did. Even with intelligence and wisdom of 18 and 14, respectively, Aeryk grew confused. It took three turns of the hour glass for Aeryk to negotiate the layered tapestry of the Player’s Manual. Try as he might, he could not imagine making fellow adventurers endure the same process just to roll a character. Indeed, Aeryk recalled a time long since past when his noble friend Jonathan did roll a character in the span of an elementary school lunch break. Should not the wise and all knowing Player’s Guide be a tome of straight forward knowledge, clearly indexed and measured as a means of catering to diverse learning styles? Moreover, where was the Arcana of the Sages which governed the spellcraft that the gods saw fit to bestow upon him? Though his command of Magic Missile was without question, Aeryk knew not how to invoke the Fountain of Flame, even with the help of the Red Box’s reference cards. At the intersection of incredulity and anger, Aeryk’s character sheet became a play thing of cats and Adam re-emerged from his conceptual slumber. “Surely the Dungeon Master’s Book will spell things out,” I said to the cat as he gleefully batted about Aeryk’s character sheet. 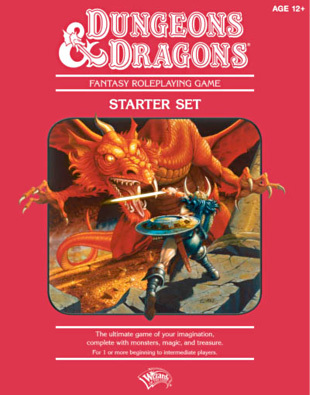 Though the DM book contains a starter campaign, guidelines on how to write and design original stories, and an ever-so-brief bestiary, it offers nothing on detailed spell instructions or, what I deem to be the most important part of starting an RPG, clear and linear instructions on how to roll a character. Taking my outrage online, I discovered that to make a character without jumping through the Player Manual’s hoops – not to mention its very limited classes and races – I would need to buy the full player’s manual. Who knew it would only take three hours for me to hit the point of exponential growth in the D&D spending curve? After buying a bigger player’s manual, I would need a new DM manual. Once I was done with the DM manual, I’d probably need a monster manual to design a campaign. Here I thought D&D was supposed to orbit around communal story-telling, not me spending more money on books than I did during my final year of Undergraduate studies. To reiterate, I knew that if my group and I got serious about D&D, we would need to buy some supplemental resources. But the bait and switch nature of the red box is nothing short of terrible. I compare this expereince to when I bought the Battletech 25th anniversary box set. That set gave players everything they needed, with no caveats or exceptions, to engage in the glorious robot on robot warfare that is Battletech. If I wanted to build a custom lance of mechs, I could do that. If I wanted to know how a Large Laser meted out damage compared to an AC/5, there were reference tables. In the three hours it took to unbox and read the first Battletech rule book, I knew enough about the game’s mechanics to easily manage two, six-hour combat sessions, up to and including when my opponent wanted to know if he could “Death From Above” one of his mechs on to one of mine. The problem with the D&D starter set is that no matter how many times I read the given rules, I can only play the game in the exact way it wants to be played. Creativity, even something as rudimentary as creating a character, requires doubling down on the expense of the initial box and buying more materials. That, in my humble estimation, is poor design and lousy product roll-out. A game developer shouldn’t resort to trickery to get people to invest in their IP. Ideally, the IP should be good enough that I, as a gamer and customer, want to spend more of my money. Thanks but no thanks, Dungeons and Dragons 4th Edition. I’ll be returning you for a refund and giving either Pathfinder or Apocalypse World a try.